The band trailer after it was gutted by Fox and his crew. 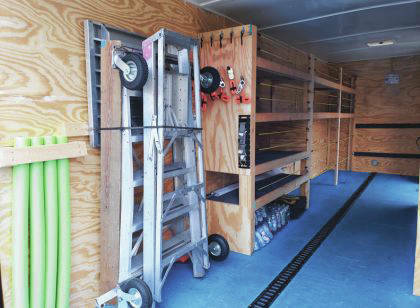 Submitted photos Xenia High School junior Jake Fox decided to refurbish the band trailer for his Eagle Scout project. In this photo he is tearing out the existing celing. The interior is starting to come together. In the trailer is Fox’s father, Eddie (blue tank top), who helped with the construction aspects. XENIA — As a passionate member of the Xenia High School marching band, Jake Fox knew the band’s trailer needed a major upgrade. And as an equally ardent Boy Scout, the 16-year-old was searching for an Eagle Scout project. The XHS junior accomplished both major feats at once, herding a group of friends and totally refurbishing the 17-year-old trailer front to back, top to bottom and side to side. 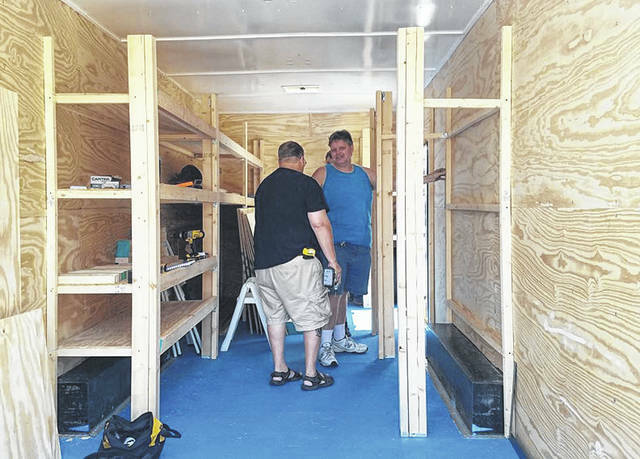 So along with father, Eddie, current band member Kolby Mueller and band alumni Noah DeLotelle, Paul Johnson, and Taylor Coleman, and Christopher Shaw, a scouting friend from Cedarville, around 402 man hours from June to August were spent gutting the trailer and rebuilding. 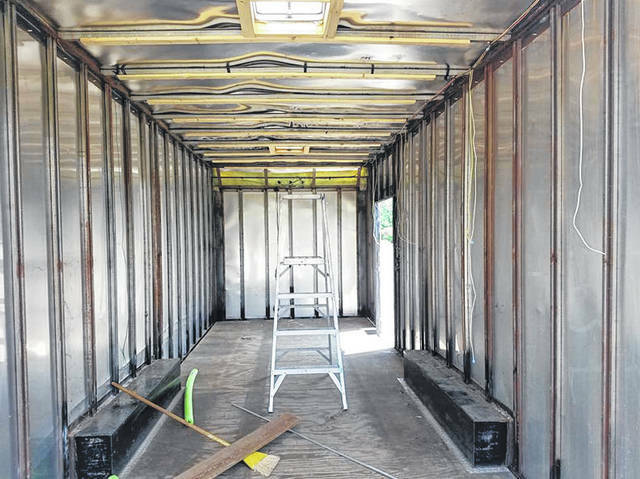 After tearing the inside out, the trailer received a new ceiling, new lights, new carpeting, new racks and non-skid paint for the floor. The project cost $2,050 and through donations from Lowe’s, Handyman Ace Hardware, Xenia Rotary, the band boosters, and an anonymous donation of $750 it was fully funded. Eddie Fox helped with the construction aspect, advising Jake and his friends about lengths of nuts and bolts to use and such. Jake was hoping it would be ready for band camp, but some unexpected post-repair leaks in the roof set the project back a few weeks. Nonetheless, the project was a success. Band director Zavaan Johnson was impressed with the work. Fox will present his project to the scout’s board of review in the spring and his Eagle Scout status will be determined. He also has to finish six month of leadership, which is part of the Eagle Scout process. Only 4 percent of Boy Scouts are ever granted the Eagle Scout rank, the highest rank attainable in the Boy Scouting program division of the Boy Scouts of America. Since it was first awarded to Arthur Rose Eldred in 1912, Eagle Scout has been earned by more than two million. Requirements include earning at least 21 merit badges and demonstrating Scout Spirit, leadership, and service. And of course, the Eagle Scout service project where the scout must further demonstrate service and leadership. It was a daunting task in deed, but Fox is confident he met the requirements. “I think my chances are going to be in my favor, let’s just say that,” Fox said. https://www.xeniagazette.com/wp-content/uploads/sites/32/2018/12/web1_gutted-1.jpgThe band trailer after it was gutted by Fox and his crew. 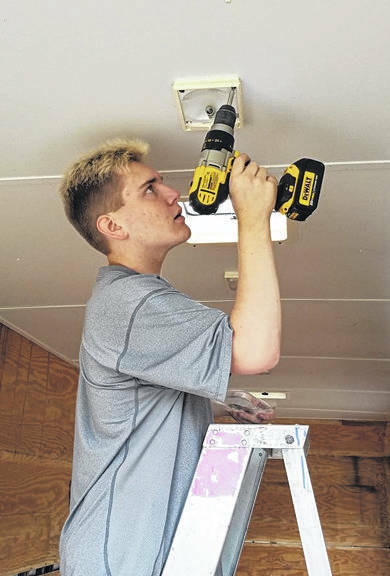 https://www.xeniagazette.com/wp-content/uploads/sites/32/2018/12/web1_Jake-tearing-out-celing-1.jpgSubmitted photos Xenia High School junior Jake Fox decided to refurbish the band trailer for his Eagle Scout project. In this photo he is tearing out the existing celing. https://www.xeniagazette.com/wp-content/uploads/sites/32/2018/12/web1_interior-coming-together-1.jpgThe interior is starting to come together. In the trailer is Fox’s father, Eddie (blue tank top), who helped with the construction aspects.